My name is Paul Karl from Beacon Falls, CT. This year has been a year of highs and lows! Last year, I experienced the high of all highs. I had lost a LOT of weight. As many of you know, I started my journey at 445 pounds and was able to lose 94 pounds by the annual event. I felt lighter, healthier and much fitter! These results allowed me to be more able to fully enjoy life. I was able to enjoy going bowling with my family and friends weekly, the thrill of amusement park rides, and the greatest reward was being able to keep up with my family. When I was on stage at the 2013 YOR Health Annual Conference, the support and compassion I felt from the YOR Health Community was amazing. I couldn’t hold in my emotions with all of the love I could feel coming from the audience. Afterwards, many of you continued to lend your support and inspiration for me on Instagram and Facebook. That kept me energized to keep going on my journey. In short, I won 1st place in my 2nd challenge and joined the ranks of the 100 Pound Club, but the BEST result was one day, my 5-year-old son and I were playing and he burst out with, “My daddy can play with me now!” It took my breath away! The look of joy on his face made all of the hard work, challenges, and struggles worth it. Even with all the positive developments in my life, I did not realize that my toughest challenge was yet to come. Throughout the year I had been in physical therapy rehabilitating a back injury I have been struggling with from a fall when I slipped on ice prior to getting enrolled in the 8-Week Challenge. It was one of the main reasons why I got started, and all of the weight loss has been very helpful in my recovery. In late October, however, something changed. Minor back discomfort and stiffness became serious and debilitating pain. Every day functions became more difficult. Just sitting at my desk at work my back would tighten up and when I tried to get up I couldn’t straighten my back. Even just walking or standing I would experience shooting pain around my waist. It felt like someone was stabbing me. At first I tried to work out the problem. I tried several medications prescribed by my doctor, from muscle relaxers to anti-inflammatories. But that didn’t work. I hired a personal trainer and had PT three times a week to work on strengthening my back. But that didn't work. We had to cancel a family trip to Walt Disney World. It was a tradition I didn’t want to let go, but I just couldn't handle the walking around or standing in lines. 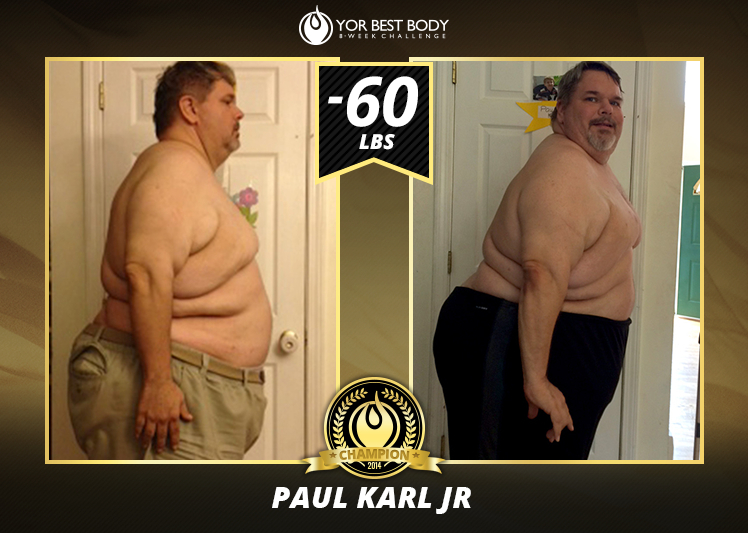 Despite the challenges, I stayed dedicated and continued using my YOR Slim Set daily. Because my exercise had become restricted, I had to completely rely on the products to continue my weight loss journey. I even added the YOR SuperGreens that I resisted for about 6 months because of that “Hulk” looking color. However, when I started taking them, I could feel the vitality and alertness. My continued success reinforced my belief in the products! Although, much slower, I continued to experience weight loss with very little physical activity. 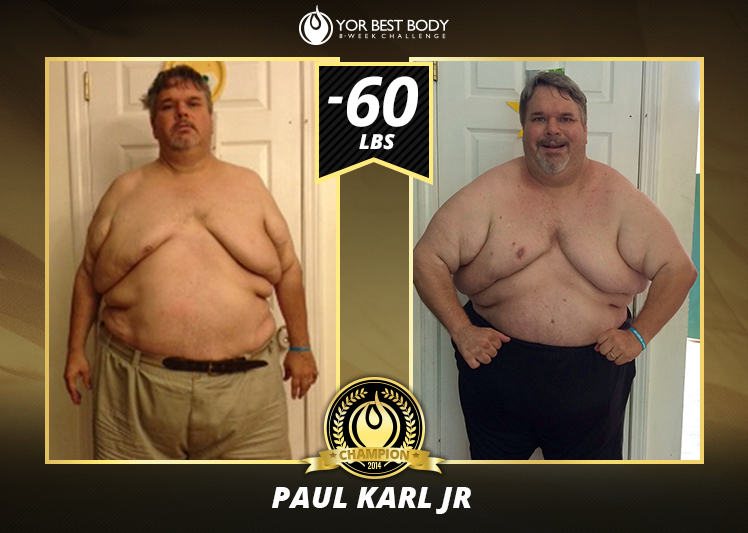 I continued to have positive results with just using the YOR Health products and eating sensibly. Throughout the spring, as the condition with my back continued to get worse, my physical therapist finally became convinced that the problem was not muscular. My balance was getting worse and I was falling more often. I also began experiencing episodes of incontinence, which would come on with little notice. Do you know how embarrassing it is for a grown man not to be able to control his own bowels? Do you know what it is like to fear being in public and getting humiliated because your pants would become soiled and stained? I’m even afraid to schedule meetings, as I have no warning when Mother Nature will call. I now have to keep a change of clothes at work and in the car, just in case. Doctors finally authorized an MRI, which showed a condition called spinal stenosis in my lower back. It was a very scary diagnosis. Essentially, the bone of the spine is growing into the spinal cord and compressing it causing a loss of sensation and feeling in my lower extremities. The only treatment is significant surgery, but even that is considered “risky” with a difficult recovery. The surgeons are not even sure if any damage will be permanent. However, there is really no choice, as my quality of life has become one of just existing. I'm dependent upon my wife Renee for so much that I can't do. She has been a saint in taking care of me and being patient with all of the challenging episodes we have faced. I've had to start using a walker to keep my balance, stamina, and to keep myself from falling. The only way I can find relief is being reclined on the couch. Emotionally, I've been in severe depression. I feel like I'm back to where I first started. Steroid medications make you feel so much heavier and BLOATED. My biggest fear has returned. I have to again watch my son play while all I can do is sitting on the couch. My biggest joy of spending quality time with my wife and son has been taken from me. The doctors will not perform the surgery until I am able to lose more weight to lower the risk of re-injury and lessen the recovery period. They will not operate until that happens. In the past week I had 3 medical doctors recommend bariatric surgery. I have told each of them that I have a better solution; I have the nutritional support from the YOR Health product line; I have the loving support of my family and friends; and I also have the emotional support of everyone in this company to ensure that I continue down the right path. I have now lost 130 pounds. I never could have imagined how far I would have come in just 1 year. The ball is in my court and I will fight for my health! I will not give up or give in because it’s not about me anymore. It is about the thousands of people who have hit rock bottom and don’t believe there is a solution out there that will work for them. I’m here to show everyone that, NO, I’m not where I want to be, but I know that with all of the love, motivation, and support that YOR Health offers, I am on the right path to health and happiness. Without this company, I don’t even want to know where I would be. Thank you!